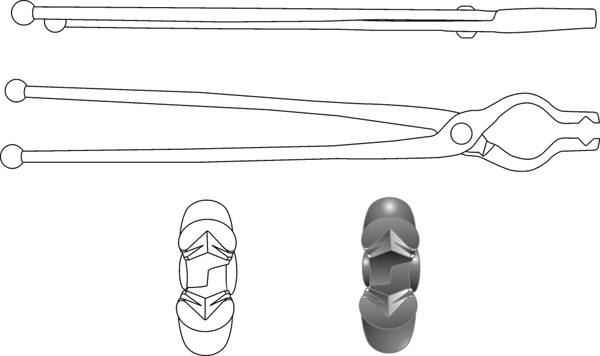 The Billy V-bit Bolt Tongs were designed to hold round or square stock with or without decoration on the end. These are probably our most versatile and best selling tongs we make. The foreign made tongs have a smooth finish. The jaws are rounded on top with a V notch in the front of the jaw running its length. The side has one V-notch about 1/2" from the jaw end and the jaw opens up before the rivet allowing you to hold decorative pieces such as hooks, scrolls etc. They are perfect for hard to reach areas and are quick to use in many situations. The handles are round to flat with balls on the ends. 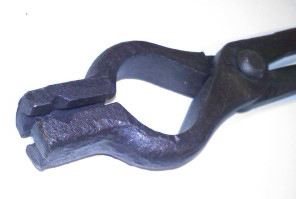 Great for use at the trip or power hammer. Forged from 4140 carbon steel. The USA version of the tong does not have as smooth a finish. They have a forged feel, reins are more tapered and do not have balls on the ends. Some find that the balls got in the way of certain tong rings. Forged from 1045 carbon steel.